Question: Why do Democrats dominate Maryland elections? Answer: Democrats have superior candidates. St. Patrick’s Day parades mark the start of election year in Maryland — more so than ever this year — because primaries have been moved up to June. Three months from St. Pat’s Day to Election Day. Nearly every Maryland city and town had a parade this weekend, and nearly every serious candidate — both Democrats and Republicans — was marching (or sometimes riding in a convertible.) 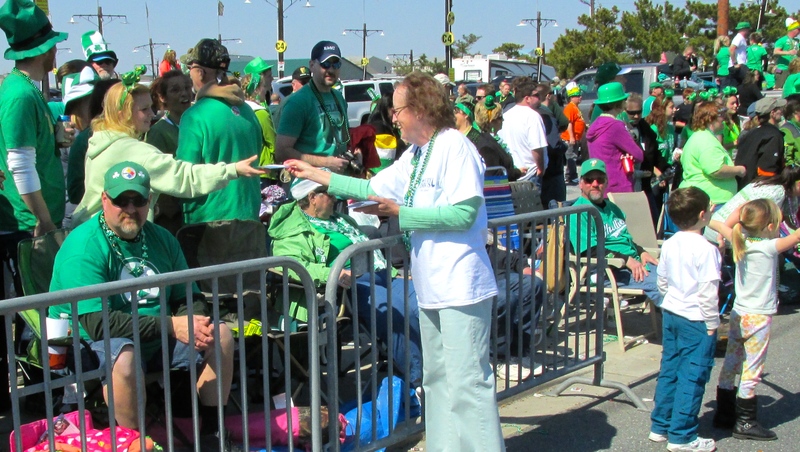 Let the record show that Saturday was a perfect, sunny day for a parade in Ocean City. Democrats hold a solid majority in Maryland’s General Assembly. Republicans, as always, hope to improve their minority position. They might pick up a seat or two, but that’s about the limit. Democrats have better candidates nearly everywhere in Maryland. A case in point is District 38, located in the far southeastern corner of the state, the Lower Eastern Shore (Worcester County, Somerset County, and part of Wicomico County). District 38 will likely have some of the closest and most hard-fought elections in Maryland this year. Let me explain. Many people presume that the Lower Eastern Shore leans Republican, either slightly or severely. History and election results indicate otherwise. Four years ago, Democrats gained a Senate seat on the Lower Shore when Jim Mathias, former mayor of Ocean City, defeated a Republican businessman. In 2014, Democrats have every reason to expect to hold the Senate seat AND pick up one or even two seats in the House of Delegates. But it’s hardly a foregone conclusion. Neither party will have competitive legislative primaries in District 38. All the action — and it could be hot– will be in the November General Election. Both sides are already hard at work. Did we mention superior Democratic candidates? 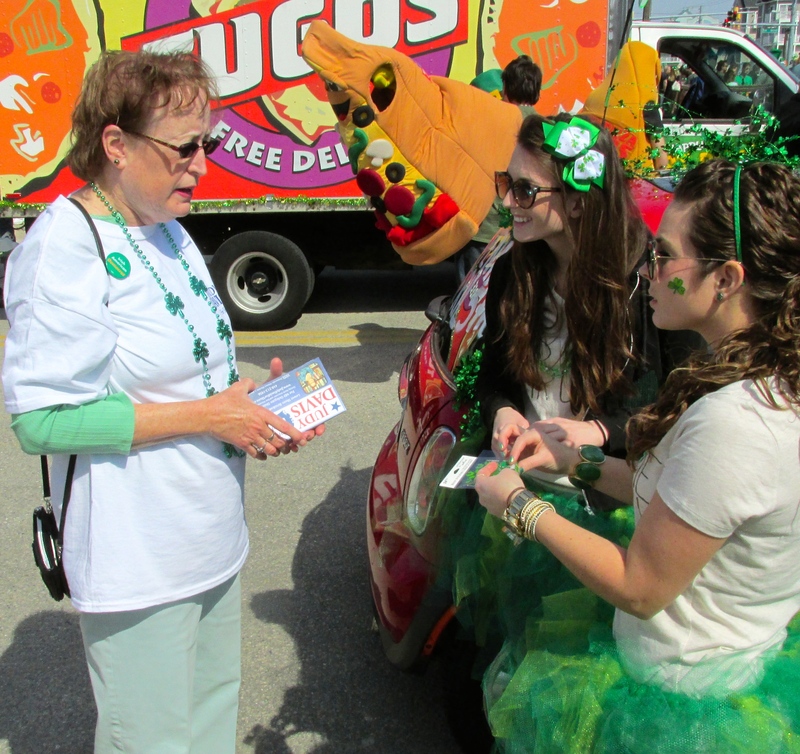 Judy Davis chatting with voters before the parade. Ms. Carozza returned to the Shore last year specifically to run for the open delegate seat. Republican operatives from Washington, D.C. where Carozza had a career in Republican politics, are funding her campaign big time. But it will be hard to buy an election in this small-town, one-delegate district, where people know each other. Judy Davis has lived and taught school here for decades. 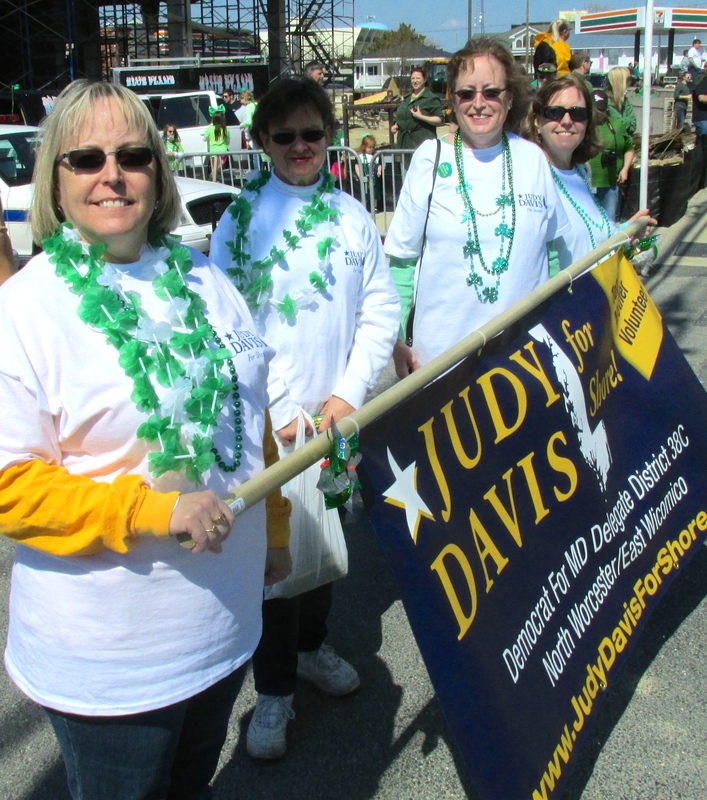 Davis is a graduate of the Democratic Emerge Program, which prepares promising community leaders like Judy to run for public office. I think Democrats, seeing the opportunity to pick up a seat, will give her strong support. District 38A — May lean by a hair to the Democrats. 38A includes all of Somerset County and the southern half of Worcester County, including Pocomoke City, Snow Hill and Berlin. In 2012, President Barack Obama won Somerset County by a handful of votes. The Democratic candidate, Percy J. Purnell Jr. is a definite threat to unseat one-term Republican Del. Charles James Otto. Otto is quite popular in the Somerset County part of District 38A. I give Otto a slight advantage in a close race in Somerset. But the election will be won or lost in the Worcester County part of the district. The outcome will depend on which party can turn out its voters in this sprawling rural subdistrict. To recap: District 38 is currently represented by two Democrats and two Republicans. The two Democrats, Sen. Jim Mathias and Del. Norm Conway are likely winners in 2014. The other two delegate seats will be close races. I give the edge to Democrat Judy Davis in 38C and Republican Charles Otto in 38A, with Democrat Percy J. Purnell Jr. making a strong challenge and possibly edging Otto. A Democratic sweep in this district would be a painful loss for the minority Republicans. 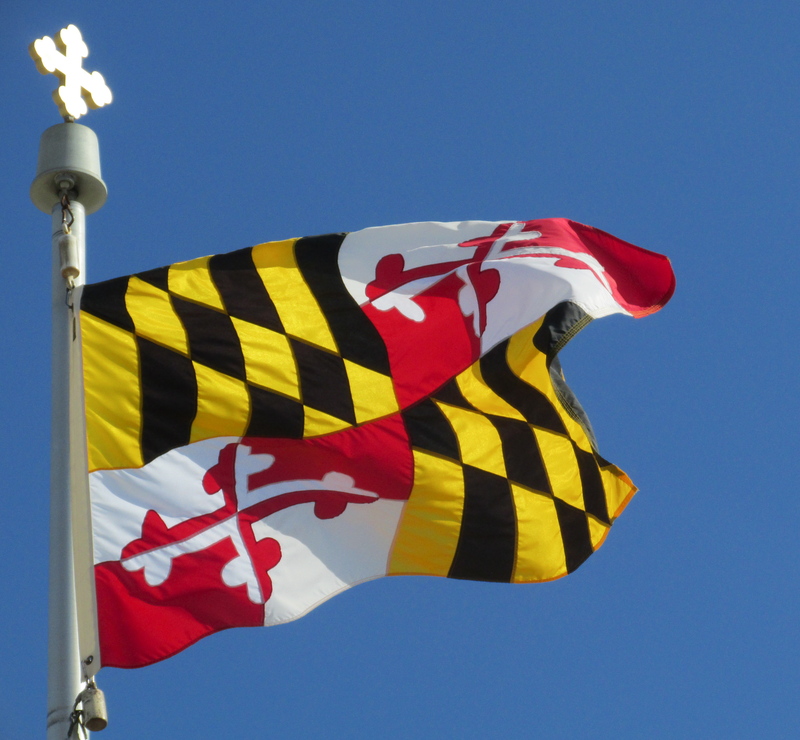 The Feb. 25 deadline for candidates to file to run in Maryland’s 2014 state and county elections is near, and the candidate list in Montgomery County is looking pretty thin. As of Feb. 17, only two of Montgomery County’s eight State Senate seats will be contested. The other six Senate candidates in MoCo will get a free ride. District 17 (Gaithersburg and Rockville) Del. Luiz Simmons vs. former Del. Cheryl Kagan. District 18 (Silver Spring, Kensington, Wheaton, Chevy Chase, Garrett Park) Sen. Richard Madaleno vs. Dana Beyer. Six of MoCo’s Senate candidates will run unopposed in the Democratic Primary. Even worse, it looks like all eight Democratic candidates after the primary will be able to take the summer and fall off. Not a single Republican has filed to run for Senate in MoCo. It’s not as if we have no Republicans living in MoCo, but the Republican Party has few candidates who wish to sign up to be sacrificial lambs. The Republican Central Committee may yet twist some arms to field a few more candidates. The lack of opponents in both primary and general elections for State Senate is not unusual anywhere in Maryland, but it’s not good for the candidates, voters, or democracy. Competition would make all the candidates sharper and more forthcoming on the issues. Given a selection of candidates, rather than just one, voters might over time improve the overall quality of the General Assembly. The two main reasons for the dearth of Senate candidates: gerrymandering and money. Most of Maryland’s legislative districts are drawn so that one or the other party has a clear edge. It takes a brave candidate to run against heavy odds. Did we say money? It can take $250,000 to $1 million to fund a quality campaign in a contested Senate race in Maryland, whether it’s a primary or a general. Raising that amount of money is daunting for anybody, and nearly impossible for any new or unknown candidate. Of course for incumbents who run unopposed, campaign expenses are not much of a problem. You don’t need quite so much money to run for House of Delegates, so we sometimes have the luxury of choosing from as many as eight or 10 primary candidates for three delegate seats in a district. In the few districts where both Democrats and Republicans can expect some reasonable prospect of winning, the general election often has three Democrats and three Republicans facing off. As it stands now, there’s plenty of room in Montgomery County for additional delegate candidates in some districts. The two districts with contested Democratic primaries for Senate also have good competition for the delegate seats. District 17 has six Democrats and one Republican candidates for delegate. District 18 has seven Democrats but no Republicans. Districts 14 and 15 have a minimum level of competition, four Democrats and one Republican in each district. District 16 has five Democrats and one Republican running. District 20 has the largest field, nine Democrats and one Green candidate. No Republicans. District 39 is the district most in need of candidates. Only three incumbent Democrats running unopposed for delegate, and one Republican. District 39 is north and east of Gaithersburg, that is, Germantown and Montgomery Village. District 39 doesn’t have the long history of Democratic activism that you find in the southern part of MoCo, Districts 16, 17, 18, 19 and 20. Unlike Gaithersburg, Rockville, Chevy Chase and Takoma Park, Germantown has no municipal government and is the most recently developed part of the county. With no local officials and few candidates for legislature, there’s not much reason for the newer residents in Germantown to become active in community or politics. I’ve saved the worst news for last. Put your fingers on the wrist of the County Council race, and you can hardly feel a pulse. As of Feb. 17, we have only one Democratic candidate filed to run in each of the county’s five council districts. Not an indication of a healthy democracy. We’re still waiting for at least one more shoe to drop in Council District 3. No Republicans in any of the five districts. For the four at-large County Council seats, we have exactly three Democratic candidates. They are incumbents Nancy Floreen and George Levanthal, and newcomer Vivian Malloy. Also, there’s one Republican and one Green bidding for the at-large seats. We can certainly expect at least two or three more Democrats for the at-large seats. Several incumbents have yet to file. Also Doug Duncan has still not filed officially to run for MoCo County Executive. For information about how to become a candidate (it’s cheap and easy to sign up, costly and difficult to win) look at the Maryland Election Board web site. You can also find information on voter registration and results of previous elections.